You’re being called to great things. Whether you feel your life is ordinary or extraordinary, you continually build your legacy each day. Will you answer the call? Will you fulfill the highest vision for your life? You absolutely have the strength to do that and more, and every answer lies within your reach. Resist the urge to wait until circumstances are more convenient. Fight the tendency to hold back and procrastinate, hoping conditions might not be so difficult eventually. Now is the time. Don’t be afraid of responsibility and don’t wish it away. 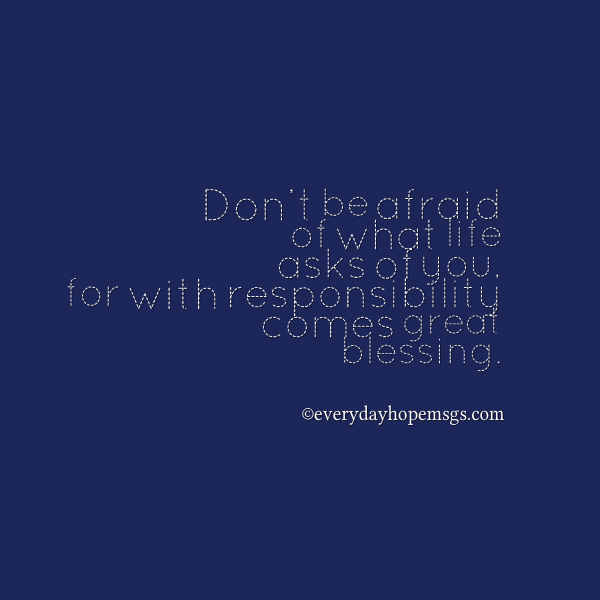 Don’t be afraid of what life asks of you, for with responsibility comes great blessing. While resistance naturally accompanies added responsibility, it is also how your strength is built. If you only do what is easy and comfortable, you will remain stagnant and weak. You will not fulfill the journey for which you’re meant. Your abilities and talents are gifts from above. They have been entrusted to your competent care. Nurture them, hone them and make use of them. Put them into practice in your daily life. Vow today to take up the challenges before you. As you do, you will discover the strength you’ve possessed all along. It will bloom amidst life’s difficulties and it will carry you forward. Things may not be “perfect” now, but it’s a perfectly good time to tackle what you’ve been resisting. Accept the gifts you’ve been given and embrace the responsibility that comes with your unique path. You are meant for great things.